Mainly clear. Low 38F. Winds light and variable.. Mainly clear. Low 38F. Winds light and variable. 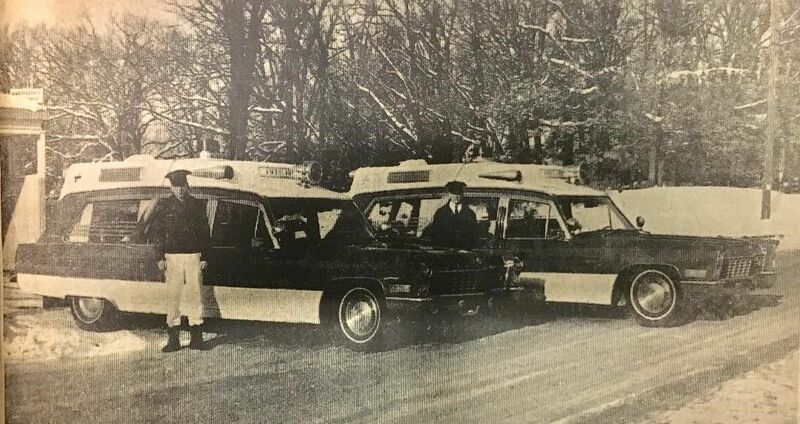 Wednesday, Jan. 7, 1970: The Memorial Hospital and Nursing Home ambulance service officially began Thursday, Jan. 1. The service provides two 1967 Cadillacs with 54-inch head room and superior bodies. The ambulances are fully equipped and are capable of carrying four stretchers each. Pictured with the units are Orin Falks, left, an attendant, and George McCartney, head of the ambulance department. The Town Board received several bids to build the new bridge. Some bids were too high, others not by practical mechanics, hence all were rejected, and it has been decided to hire men by the day, purchase the material and build the bridge as cheaply as possible. Uriah T. Owen has been employed to superintend the job and expects to commence operations next week. It is expected the work will be completed in five or six weeks. On Dec. 23 about 3 o’clock in the morning the fold of David Shafer was entered, and the peace and dignity of the flock was assaulted by—wolves? No, by thieves. One sheep was taken and another made a very narrow escape judging from the amount of wool sacrificed, Mr. Shafer is satisfied from circumstantial evidence where the sheep went as he was able to track the parties westward on the Hudson road. TO THE PUBLIC: “With age comes experience.” Two years active operation of an electric light plant has led us to make a change in our meter schedule, and we offer the citizens of Menomonie the fruits of our experience. We have reduced the number of 16-candle power lamps required to install a meter from 20, the former limit to 12. Thus persons having need of but 12 lights in their residences are not required to pay for the wiring in of 20 as before. We will also install all incandescent wiring upon a time and material basis, which owing to the cheapness of electrical material at present reduces the cost of wiring from twenty to fifty percent per light. For specifications and all information regarding the above apply to Menomonie Electric Light & Power Co., or C. F. Tutbill, Wireman. Lieut. Louis Larson of Menomonie has died a hero’s death under heavy shell fire. “Headquarters, First Battalion, 355th Infantry, Germany, Dec. 10, 1918. Mr. Carl A. Larson, R. F. R. No. 6; Box 99, Menomonie, Wis.
“Sir: Your son, Lieut. Louie Larson, lost his life Nov. 3, 1918, during an advance by enemy shell fire. After we had started our advance we were subjected to heavy and accurate shell fire, and your son, without thought for his own personal safety, rendered valuable assistance in keeping his platoon organized; during this heavy shell fire Lieut. Larson went among his men instructing them how to best get protection, and losing his life in his tireless efforts to save his men. Resolved, that in behalf of the city council and mayor of the City of Menomonie the following resolution be adopted in tribute to the memory of our late fellow member and distinguished colleague, Clinton Merrill Peddycoart. The City of Menomonie and its city council has lost by death many distinguished and loved members. None are more genuinely mourned by its rank and file in the sense of personal loss an extend as is Clinton Merrill Peddycoart. By his death we have lost a beloved associate whose outstanding character as a businessman, who at all times had the welfare of his fellow men at heart, as well as the community in which he lived, has reflected high honor upon this council and his memory is worthy inspiration for all-time. His was a sterling character reflected in his interest in the service men of World War II, as well as veterans of other wars. Be it further resolved that a copy of this resolution be spread upon the official minutes of the city council and that a copy be transmitted to Mrs. Peddycoart that we may extend to her and to the members of the family an expression of our sincere sympathy. The hockey program in the city became a victim of the large accumulation of snow — for a couple of weeks, anyway. The boards for the rink were constructed and put in place on the Wolske Bay Lagoon ice by Stout and high school students. For a few weeks everything went fine and the rink was in constant use. However, the snow became a problem and when tractor with a front end loader was employed to remove better than two feet of the white stuff, it broke through the rotted ice and a crane was needed to lift it out of the water. It was decided then to relocate the hockey facility on dry ground. However, the hockey enthusiasts faced the problem of removing the boards that had frozen into the lagoon’s surface in one piece. With the help of Boots Haynes, the parks maintenance chief, and his crew, the boards were dismantled undamaged. Now, according to Ken Erickson, a member of Stout’s faculty, the rink is to be located in the vicinity of the Blue Devils’ fieldhouse. It is hoped the rink will be in operation by this week end so the Stout team can host a St. Paul club in a full scale game. The Menomonie Area School District will be four or five classrooms short next year. Principals at all Menomonie schools reported to the board Monday the current enrollment and how many students were expected to attend in the 1994-95 school year. Principals Lee Benish and Bob Klimpke said the high and middle schools will be tight but will survive next year. “We got about a year to play with,” said Benish about the high school. “But we’re going to be in trouble in 1995-96.” The high school enrollment is currently 968, up eight students since the official third Friday count, Benish said. He expects, based on the students already in the district, there will be 1,014 students in high school next year. The middle school averaged about two new students a month since the third Friday count, Klimpke said. There are 542 students currently enrolled. River Heights Elementary had 546 students enrolled in September. There are 569 students now, said Tom Mangin, principal. Enrollments at North and Cedar Falls schools have not changed, said Principal Nick Kaiser. Downsville decreased from 152 in September, to a current 147. Oaklawn increased its enrollment from 405 to 410. This does not include the four-year-old kindergarten program, said principal Don Heifner. Four Menomonie firefighters have been awarded the Save-A-Life award for their efforts in saving the life of an elderly Menomonie woman on a Nov. 3, 2001. The firefighters are John Entorf, Denny Klass, Kyle Repaal and Jon Fisher. The award is presented by the Bullard Company, the maker of the thermal imaging. The firefighters used the thermal imaging camera to locate Mary Hovland, 79, during a fire at her home. On Nov. 3, 2001, firefighter John Entorf and firefighter Denny Klass of the Menomonie Fire Department arrived with the fourth responding unit on the scene of a house fire. Conditions were severe and internal visibility near zero. Two firefighters had already searched the east end of the house and hadn’t found the victim. Due to heat conditions, they were moving to attack the fire and hand off search and rescue duty to another team. Entorf and Klass headed toward the west side of the structure. As Entorf scanned the living room from the kitchen, he saw Mary lying unconscious on the sofa, less than one minute from the time the team entered the house. Hovland made a full recovery. Before thermal imaging, we would have done a hand search of the house, and in that thick of smoke, it would have taken much more time. And time was the essence that day, he said. Although they were on since December of 2007, the 32nd Infantry Combat Team—Wisconsin Guard’s largest unit—got the order on Sept. 5, 2008 to call 3,500 soldiers from across the state for active duty in Iraq. As part of the 1st Battalion, 128th Infantry, Menomonie’s Company A will once again be among those heading overseas. They will be joined by six other units to meet what the Defense Department calls “a security mission ... assigned tasks which will assure freedom of movement and continuity of operations” in Iraq. They will be part of the largest deployment of the state’s National Guard forces since World War II. Company A last served in from June 2004 to November 2005. The company is comprised of approximately 120 soldiers. About 30 percent of them will be making the return trip to Iraq. Company A will report to the armory in Menomonie in the middle of February before heading to an as-yet unspecified installation in Texas. After two months training, they will head for Iraq, where they will be stationed for about 10 months. Chippewa Valley residents have learned a new weather term: polar vortex. Also known as an “Arctic cyclone,” its dense, frigid air stretched from Montana all the way to Alabama on Monday into Tuesday. Most government offices were open, and the Menomonie City Council, was still set to meet Monday night. But dangerously cold, subzero temperatures closed all four of Dunn County’s public schools on Monday and on Tuesday. In most cases, games, classes and other evening activities also were cancelled both days. The overnight low recorded at the Menomonie Wastewater Treatment Plant was -24. By 8 a.m. Monday, the temperature had only risen one degree, reported Superintendent Paul Sterk. In early February 1996, he said the city had several consecutive days when temps registered in the negative 30s and 40s.